This was a Yankees franchise record for most runs allowed in a postseason game, eclipsing their 15-2 loss in Game 6 of the 2001 World Series to Arizona. This was the sixth time in franchise history that they allowed 13+ runs in a postseason game. The Yankees can are 4-2 in the following game, with each ensuing game in the same series. Boston's 16 runs marked their second-most runs in a postseason game in franchise history, as they put up 23 in the fourth game of the 1999 ALDS vs. Cleveland. They went on to win the next game and close out Cleveland before facing the Yankees in the ALCS, a series the Yankees won in five games. This was the Yankees' first postseason loss at home since the 2015 Wild Card Game, as they won all six home playoff games last season and the Wild Card Game over Oakland last Wednesday. The Red Sox deciding to have Nathan Eovaldi start this game instead of Game 4 on Tuesday, switching him with Rick Porcello, was as key as any reason for this win. 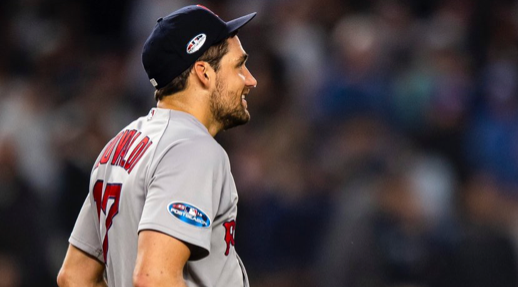 Eovaldi dominated from the start, and once he was given a lead to work with, cruised through seven innings, allowing just one run on five hits with five strikeouts. He had pinpoint control, as he threw just 97 pitches, 72 of which were strikes. Boston Manager Alex Cora said of the boost Eovaldi gave his team, "It was outstanding, efficient, great stuff from the get-go, using the fastball in different spots and mixing up breaking balls and his splitter. He's been great against them the whole season, and that was good to see tonight." Yankees Manager Aaron Boone said of why Eovaldi was so dominant, "He's obviously been tough on us all year. Once he got the lead, he just continued to pound the strike zone. The cutter was a factor. He mixed in some breaking balls and some splits but was able to locate and elevate his four-seam fastball. It seemed like he mixed in some two-seamers as well, which isn't something he does a lot of. It seemed like that anyway from the side. But he once again was an issue for us." Another benefit for Boston by switching Eovaldi and Porcello, was that if they won Game 3 (as they did), they would have their 17-game winner going out there Tuesday night to try to close out the series. For his career, Porcello is 0-2 with a 5.85 ERA in the postseason. For the Yankees it was quite a different story, as their 18-game winner, Luis Severino, was not nearly as good as he was last Wednesday in the Wild Card Game. Boston got on the board in the second when Christian Vazquez got an RBI on an infield single. The Sox started to pour it on in the third, as Mookie Betts and Andrew Benintendi singled to open the frame. J.D. Martinez got a sacrifice fly to score Betts, and Benintendi came home on a fielder's choice by Rafael Devers. In the fourth, Brock Holt blooped in a single, followed by a Vazquez single to right, and then Jackie Bradley, Jr., drew a walk, and that was it for Severino. In came Lance Lynn with the bases loaded and no outs for Boston. Lynn walked Betts to force in a run, and Benintendi followed that up with a double to right field to clear the bases and make it 7-0. Lynn finally got an out when Martinez grounded to third, but Xander Bogaerts got a single to keep the rally going, and that was it for Lynn. Chad Green was next out of the bullpen, and he got Devers to pop out to second base for the second out, but he then gave up an RBI single to Stever Pearce before Brock Holt hit a triple to right field to score two and make it a 7-run inning and a 10-0 Boston lead. Vazquez grounded to short stop to end the decisive inning. Boone said of having Severino come out for the fourth, "Just hoping he could get something started to get through the bottom of the lineup there, and then we would have -- we're going to have Lynn ready for bats no matter what. And then once the first two guys got on there, thinking Bradley is in a bunting situation, thinking we're going to take him out and go to the pen there. It just snowballed on him. Lance had a little bit of trouble, obviously, coming in there. So it just turned into a really bad inning for us." "Well, because with Dellin (Betances), we figured we only had for an inning tonight. Certainly in hindsight, we could have started the fourth inning with Robbie (David Robertson) or something, but we really felt like Sevy could at least get us a couple outs in that fourth inning before turning it over to Lynn, and then we could roll out our guys. But we just couldn't stop the bleeding at all. That was the thinking behind it." On bringing in Lynn to that situation, with the bases loaded and none out, Boone said, "Yeah, part of that, and also when we brought him in in Boston, we kind of thought in terms of that. But we also feel like we're past that and we're through that, and we feel like Lance, in a lot of ways, against righties gives us our best chance. He just didn't really have it tonight, but stuff-wise, the reason he's down there and in that spot is for that part of the lineup. He just came in struggling right away with his command. So the inning just got away." In the bottom of the fourth, the Yankees opened the frame with an infield single from Luke Voit, followed by a single to deep center from Giancarlo Stanton. Didi Gregorius grounded into a fielder's choice, which brought home Voit to make it 10-1 Boston, but Eovaldi held it there when he struck out Gary Sanchez, and Miguel Andujar grounded out to second. That was just as key, in a sense, as Boston's seven-run inning because if the Yankees responded with four or five runs, they would have had a game. It stayed that way until the eighth when the Yankees turned to rookie lefty Stephen Tarpley out of the bullpen, and Holt got an RBI on a ground-rule double, Ian Kinsler came home on a wild pitch, and Betts got an RBI single to make it 14-1. In the ninth, Yankees backup catcher Austin Romine came in to mop it up, and he gave up a two-run homer to Holt to make it 16-1. This was a historic homer, as Holt became the first player in baseball history to hit for the cycle in a postseason game. Holt went 4-for-6 with five RBI and three runs scored to complete the cycle. Cora said of Holt's achievement, "He's been swinging the bat well for a while now. We felt the matchup was good for him tonight although he was 0-for-whatever coming into the game tonight against Severino. He's been able to catch up with fastballs headed the other way, breaking balls, and pull it with power. He's a good player." Last year was a tough one for him as far as being healthy and the whole thing that went on with him, but when healthy, he can help you out. Tonight was a great night for him. In addition to Holt, Benintendi went 2-for-3 with two walks, three RBI and two runs scored; Betts went 2-for-5 with two RBI and two runs scored; and Martinez went 1-for-3 with two walks and two RBI. Severino's final line was: 3+ innings, 6 runs (all earned), 7 hits, 2 walks, 2 strikeouts. Boone said of Severino's stuff, "I didn't think he was overly sharp from the get-go. I thought stuff-wise he was okay. He certainly didn't seem as electric as his last time out. I thought he shaped some pretty good sliders. He was mixing in his change-up enough. I thought the Red Sox did a really nice job of laying off close pitches, so they didn't expand much at all in those early innings against him, so that kind of hurt him a little bit. Overall, not as sharp, obviously, as he was his last few starts, but I also feel like not too far off stuff-wise."